Traveling back to the past! I arrived to Sapporo end of September, and I have been going to a lot of classes at my university in Sapporo, so I was very much looking forward to the winter holiday to go travelling with my sister, who came from Hungary all the way to Japan to spend Christmas and New Year’s with me. We met up in Tokyo on the 23rd of December and spend 2 wonderful weeks there. It was my sister’s first visit to Japan, and I was very excited to show her everything that I love about this country. Tokyo has many great things to offers for its visitors, so we were not bored, not even for a second! On Christmas Eve, we visited Hibiya Park, where the Tokyo Christmas Markets are held. We tried mulled and German sausages. We were satisfied with the quality and the different types of the German food at the stalls. We did not expected to find such great German food in the middle of Tokyo, so we were very happy to have a bite of all these traditional European Christmas foods. With a huge mug of mulled wine, we went to see a Christmas show in the inside tent. It was a very fun event, with Christmas carols, singing and dancing. My favourite part of the trip were our visit to Tokyo Disney Land and Kamakura town. Although the Christmas season is one of the busiest season among visitors i disney Land, we had loads of fun in park. We tried different rollercoasters, my favourite one was the Indiana Jones ride, it was very adventurous. We also took part in a treasure hunt in Japanese. It was very challenging because of the language, but it was a lot fun while exploring the park. We enjoyed the end of day show with characters from Disney animations and fireworks. I love how the fireworks were shaped as Mickey or Minnie mouse. Also, because it was the park’s 25 anniversary, this was a special show with it theme song playing during the fireworks. On the 2nd of January we visited Kamakura, and all its shrines and temples. We queue up the make our wishes for the New Year. Although the main shrine was very busy, and we had to queue for an hour, we visited an other temple, where we washed our money. Did you know that if you go to this shrine and wash your money under water, the money that you wash, supposed to double in amount. It was a crazy experience with everyone washing their money, and making their for the new year. We visited the Great Buddha too. It’s huge, and the place is really relaxing.Kamakura is a lovely small town, and we finished our day on the beach. The sunset was beautiful, and we had a nice walk going back to the train statio. After two weeks of travelling in Tokyo, it was time for me to come back to Sapporo, and for my sister to go back to Hungary. My sister, never liked Japanese food before she came to Japan, said it’s the best food she ever had. On the first day I made her try taiyaki with sweet bean paste, and she didn’t like it. On our last day, she bought ankle from the supermarket to take home with her, because she came o like it so much. On top of that, she said that she doesn’t want to go back home, she wants get to know more of Japan, and learn more about Japanese. It was a great holiday, it was both of our first visit to Tokyo, but definitely not the last one. Can’t wait to be back, and explore different cities and sights in Japan! Hello everyone. Recently, I celebrated my 33rd birthday. Since I was 30, I had spent my birthday in a different country as I searched to find a place I could call home. It felt right to celebrate my 33rd in a relaxed way because I feel I have finally found a place I’m happy to call home. Now, there’s no other way to feel relaxed than to spend time away from a busy city in a place of more natural surroundings with everything available with minimal effort required. This was easily achieved in Jozankei at a beautiful hotel with excellent hospitality and facilities. One overnight stay would be all that was needed to unwind and feel completely relaxed. After being welcomed and briefed, we were shown to our western style room. Everything was decorated in a way that evoked a state of relaxation. But the big surprise was the ensuite Hinoki! The warmth and smell of the wood, which I believe is Cypress, was immediately soothing. Chisa and I scouted the room before deciding the next step was to explore the onsens. After a relaxing time bathing, we met at public relaxation space where there was a decking outside. I was the first to arrive after my bath and simply sat outside, cooling off amongst the trees gently swaying in the light breeze. I felt my mind clearing away and my desire to live in a more natural surrounding grow. Chisa soon joined me and we had a complimentary drink served to us as we sat calmly gazing out. 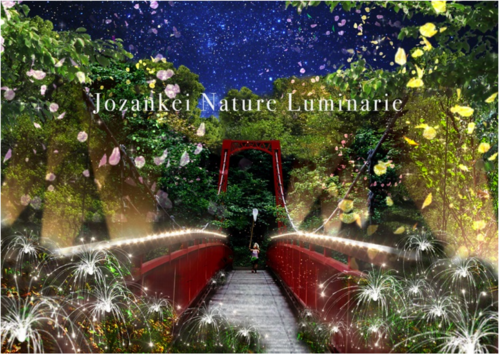 We then returned to our room to change and take a walk around outside, where we stumbled across the Jozankei illumination walkway. After our leisurely walk amongst the Avatar type landscape, we returned to freshen up for dinner. We ate in the Japanese style restaurant located in the hotel. 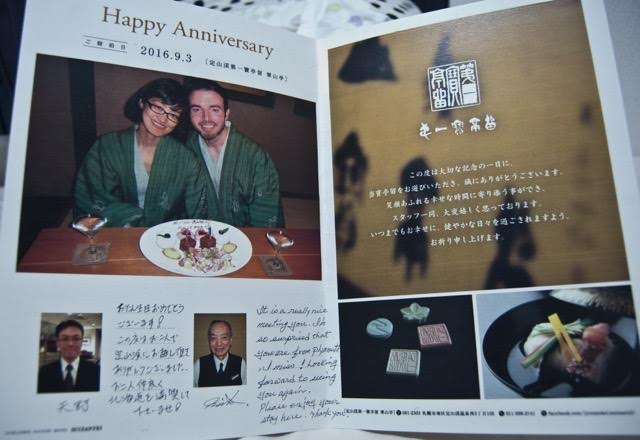 We enjoyed four succulent courses of selected soba, meat, fish and vegetables presented in various styles that left us satisfied. We were given a ticket that entitled us to one free cocktail at the bar, so we left the restaurant, entered the quiet bar, ordered our drinks and relaxed. Then, after our very tasty drinks and to my surprise, the waiter returned to deliver a platter of dessert with a birthday message inscribed. The waiter spoke good English and he even knew my hometown in England! He had a nice chat with us, to the neglect of other customers, which was quite funny. Feeling tired we soon fell asleep, especially after a side trip to the massage chairs on the way back to our room. On the next day, we had a buffet breakfast, which is always a pleasure to be a part of. Then we checked out and visited the Shiraito no taki waterfall, where water comes back from the Jozankei power plant, the oldest hydroelectric power plant operated in Hokkaido! There’s a fun fact for you! We also stopped by a local soba shop and ate a nice and cheap 500 yen serving of soba, before returning to the hotel, grabbing some omiyage and hopping on the bus back to the city. Overall, it was a perfect way to spend a birthday and a reminder of the importance of relaxation in life. So this month all of my friends and I got together to do some of our favorite things: grilling some meat and going to the hot springs. It was a special occasion because one of my friends has been in Canada on a work holiday visa since September and was only returning to Sapporo for a week, so we had to make the most of our limited time together. I’m sure many of you don’t think that grilling outside or going to the hot springs are all that special, but we don’t do stuff quite the same way in America, so it’s all still very new and fresh to me. It's December and I already stayed for over 7 month in Hokkaido. 2 month in Biei and nearly 5 month in Sapporo. I really enjoyed that time here. Actually it was too hot for me and summer and now it nearly gets too cold. But at all, Sapporo was a town, you can't compare to other towns in Japan like on Honshu or Kyushu. It's kind of different. The food... the people... the architecture... the habits... I had nice times in parks by good weather and a few nice days out of Sapporo on places like Yotei-san, Cape Kamui or Daisetzuen national park. It was nice to meet all of you at Chit Chat Cafe, some of you just once, some of you more than 5 or 10 times. I heard a lot stories and got much knowledge from local people during the conversation rounds. Some of you learned much about me and the German culture as well. Wish you all the best and many more enjoybale times at Chit Chat Cafe! how are you? Did you have a nice and spooky Halloween? I didn't do Origami for a while now, but I found a nice one some time ago and finally had the time to try it out. 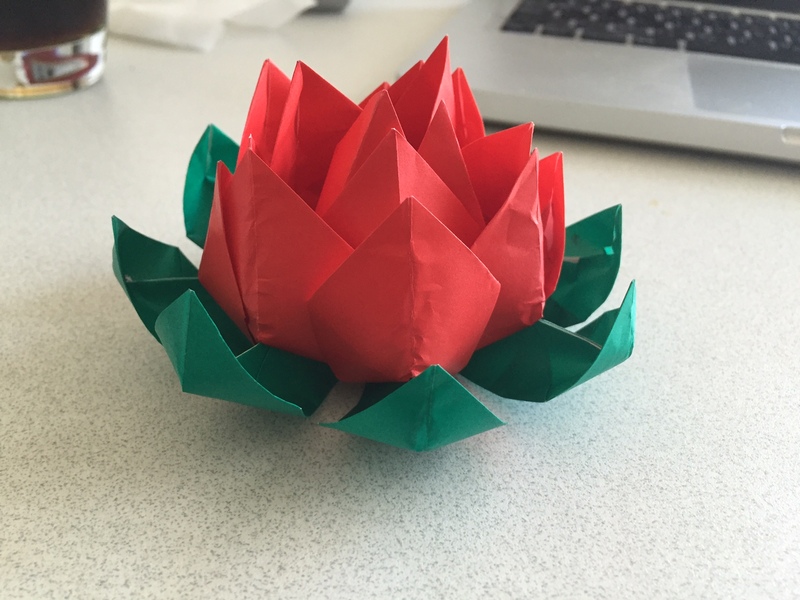 It is an Origami Lotus flower. For the flower you need 8 papers (size 13.5 cm x 7.5 cm) in a color that you like, 4 papers (size 13.5 cm x 7.5 cm) in green for the leaves and a piece of thread. The paper size is a bit unusual for Origami and you can't buy this size in the shop, but you can, for example, use standard size Origami paper and just cut it a bit at the edges. When you follow this link you can watch the folding instructions as a video on youtube. 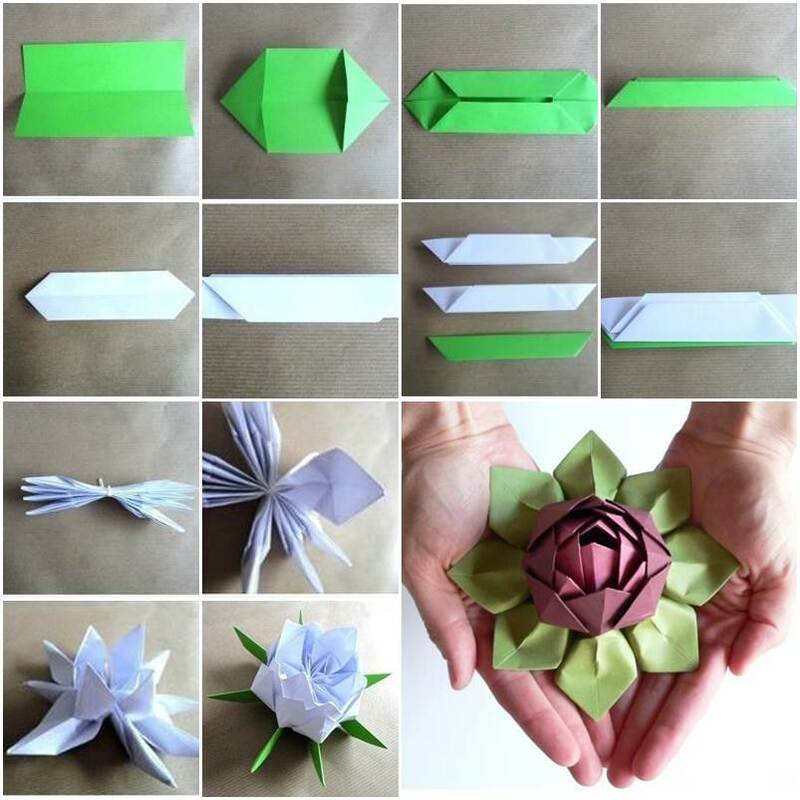 Or you can just type in "Origami lotus" into the search bar on youtube to find the video. How about making a flower in pink, red or purple? They also make a nice dinner table decoration. It's easy! I'm from Ohio in the U.S.A., and I've met one or two other people from my home state while I've been in Japan. However, I was surprised to learn that there was an important person in Hokkaido's history from Ohio. His name is Edwin Dun and he was from Chillicothe, Ohio. I had never heard of Edwin Dun when I was in school, but he was invited to Japan during the Meiji period as an oyotai gakokujin. He had experience raising cattle in Ohio, so he was hired to help with the creation of the milk and beef industry in Hokkaido! He also introduced horse ranching, horse racing, and he even worked in brewing beer and making cheese. After that, he became an envoy to Japan. I found out that his home is in Sapporo and that it is now a museum. I really want to visit there this winter! I'm doing good! 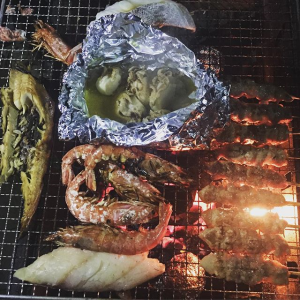 What did you do at Obon? I didn't go anywhere, just stayed in Sapporo. I went to the beergarden to have some beers. I went to Hokkaido Jingu, to buy omamori as a souvenir for my family and friends in Germany. I ate Sushi together with my husband. We rented lots of DVD's and did a movie-marathon. We invited some friends over to our place and had dinner together. We went to the Bon-Odori at Odori park and for the first time joined the dance, which was fun. So although I stayed in Sapporo, I had a really great time. Sometimes you don't have to go anywhere far to have an awesome summer holiday! Last week I was relatively busy with work, with preparations for the wedding in Germany and also with buying the rest of the souvenirs for my family and friends. Next weekend I'll fly to Germany for about two weeks and I'm already so excited. I have to transfer in Korea and I really hope there won't be a problem with the flight, since the situation between North and South Korea is not the best lately. Wish me luck! In the next blog I'll then write about my experiences in Germany! I've been living in Sapporo constantly for a month now. There is one thing, I really like, when you spend more time at one place. At first, you feel comfortable and after a while, the foreign place get's more and more to a place, you not only stay. You begin to live there. Living at a place. Living means for me, to know, where I am. To know about the infrastructure, local specialities. Living means, to settle down for a while, get off the feeling, "to sit right next to packed bags". Living means, make new mates and friends. Join the community. And this is always exciting. You meet many other people from other parts of the world. They are travelling. Or they share the same experience to live in Sapporo for a while or for years. Living means, you'll be familiar with the place you stay. And you find shelters or places, you like to return or you feel well. There are a few of those places in Sapporo and they are getting more. Nakajima-Kouen is great to relax by sitting next to the lake. I've been already twice times to the top of the Maruyama, because the view is so stunning. I think, it's time to hike up a third time, soon. Or the Hokkiado-jingu. Parks, shrines or temples are always the equivalent to the busy town. You leave the crowded places or streets and find yourself back in a more silent and peaceful environment. From day to day, it's more enjoyable to help out travellers or newbies, get more knowledge or just having a day off, to do just the things, I hadn't time before. Recently, I was talking to a student about idioms use in the English language. Before that, I never noticed that there are so many idioms connected to food, pancakes, beans, and eggs – even cucumbers, like in “as cool as a cucumber”, “to spill the beans” or “the best thing since sliced bread. But one tasty thing really “takes the cake”: cake! Maybe it’s because there is hardly any person that doesn’t like cake, or because cakes are playing a big role in our daily life – or can you imagine a birthday or a wedding without cake?! Whatever the reasons, cake is not only popular as food, but also in daily conversations. For example, you can say “it’s the icing on the cake” if something good is added to something that is already good. The situation is just getting better and better. But if you have to decide between two things, or options, where you’d like to have both, we’d say: “You can’t have your cake and it, too.” meaning you can’t have both. Or maybe you know somebody who is “as nutty as a fruitcake”? And if something is selling very well, it “goes like hot cakes”. But the most common idiom is probably “a piece of cake”. I’m sure you heard it before. But why is something that is really easy a piece of cake? I wouldn’t say that baking a cake is the easiest thing to do. It’s not very difficult either, but it is work – buying all the ingredients, mixing them in a bowl, put everything in the oven….. – and I can remember a couple of times when I didn’t have quite the result I wanted. So where does it come from? I was teaching french the other day and my student and I were discussing the following phrase found in an article : “French people spend their free time intelligently”. I had never really thought about it but it is true that we spend a lot of our free time visiting museums, going to concert, going to the theatre, reading, visiting castles and historical sites. I don’t know if we can call that “spending time intelligently” but we do think that we can expand our knowledge while relaxing and playing. Aaaah! Playing! This is one thing I really miss! France has a long tradition of family game! I can remember spending rainy Sundays, reunions, holiday car trips, or just free evenings playing with my family or my friends for hours either board games, playing cards games or one shot games. I think every family has a game closet where worn board games pile up along with few dying sets of playing cards! And every family can recall laughing, shouting or arguing with each other over a game, a score, a mistake or anything else that can happen in the game! Let’s drink (tea or coffee of course!) and have a chat at the cafe then! See you next time chit chatters!